As with the other sections, this little section was completed in several steps as it included a few different techniques. The blue leaves in the pattern indicate needlework, the green and blue background with squiggles is double vermicelli with sequins, the letters and numbers are the addition of 3D elements and the circles with crosses are jewels. I was to learn a rather surprising lesson about Haute Couture in this section as there are frequently areas that are hidden. This means that you may spend hours, days even, working on a certain piece, making sure that it is as perfect as you can get it to discover that it will be covered by something else! An added detail will completely hide your painstaking work from view and admiration. The teachers assured me that the consolation was that you, the embroiderer, knew the work that was involved and could quietly appreciate the attention to detail. C'est la Haute Couture they patiently explained. I was incredulous at the thought of this humble acknowledgement of craftsmanship, because the pride I felt after learning each new technique made me want to exclaim my glory on the streets of Paris! Of course I didn't realise any of this at the first stages and so I carefully created the stem in gold tube beads, using the technique for merging rows of beads. 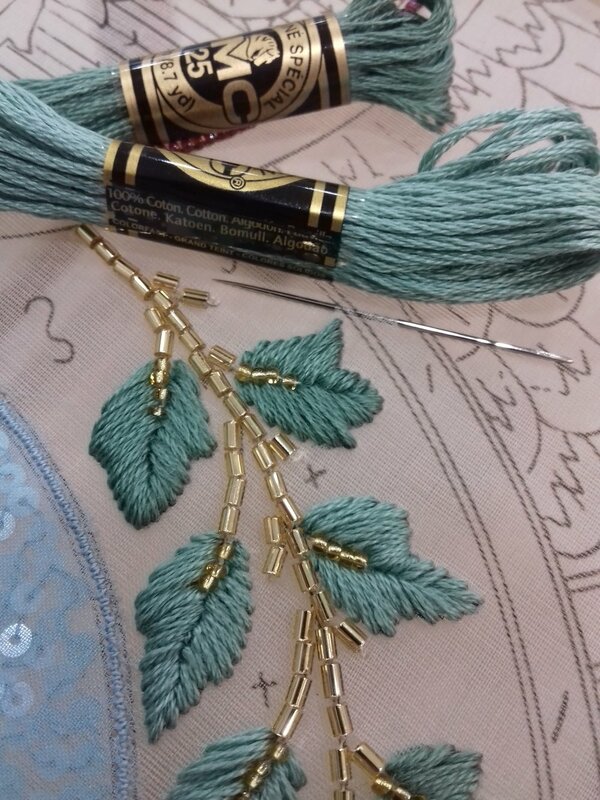 Next the leaves were added in two slightly different shades of green embroidery floss using satin stitch. I was much happier with my satin stitch here compared with the sampler of techniques and was delighted with my improvement. The teacher advised that I wasn't pulling the tension of the thread tightly enough after each stitch and this made them uneven and untidy. Also, these stitches were diagonal which definitely worked to my advantage! The double vermicelli technique involves the same principle as the regular vermicelli, remembering to change the direction your stitches each time and working in curved waves that never develop into a pattern. With the double vermicelli an empty stitch is included between each sequin that is placed, leaving the space to fill in with the next layer. The first layer was turquoise and the second layer was sunshine yellow matt sequins. 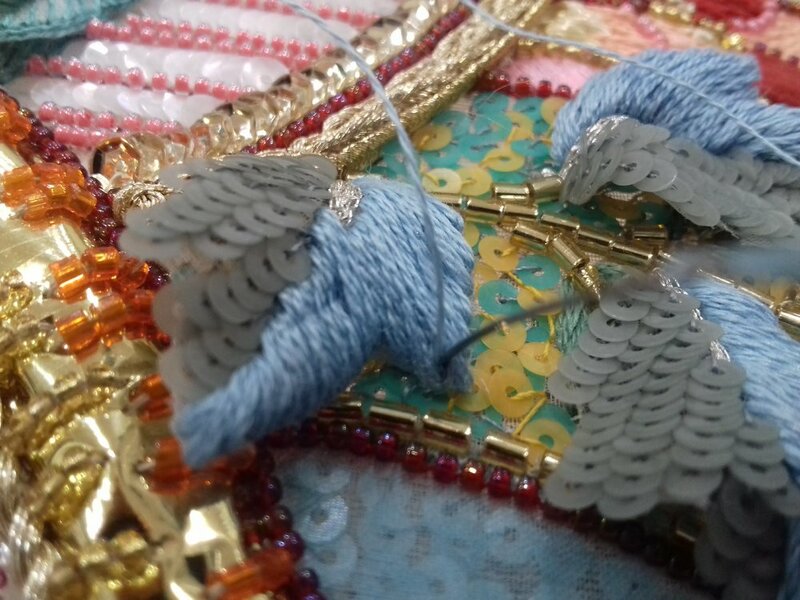 Again, the matt sequins are very tricky to work with as they don't slide apart and are often stuck together, not to mention their minuscule size of 4 millimetres of diameter. Along the side of the design is the pattern for 14 different leaves. 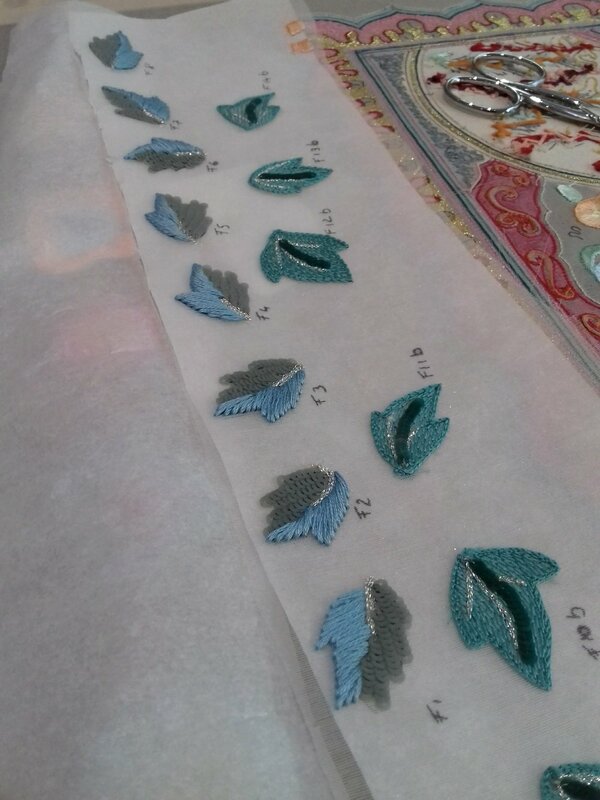 The ones with light blue satin stitch, grey sequins in a river and silver stems are for this section (the other leaves were used in other sections). Once they are completed transfer glue is ironed onto the reverse and then they are cut out of the organza and the frame is re-mounted. Each leaf is cut with a 7 mm border and then cuts are made as close to the stitching and sequins as you dare. The paper is removed and the organza border is ironed onto the back using a very low heat. As each leaf is individual, it was necessary to keep them organised carefully so that there would be no confusion later. The time arrived for me to learn the meaning of Haute Couture... I gasped when the teacher explained that the individual 3D leaves were to be applied on top of my lovely satin stitch leaves! I lamented as they receded into the leafy shadows of the extravagantly curved, flicked and overlapping foliage. 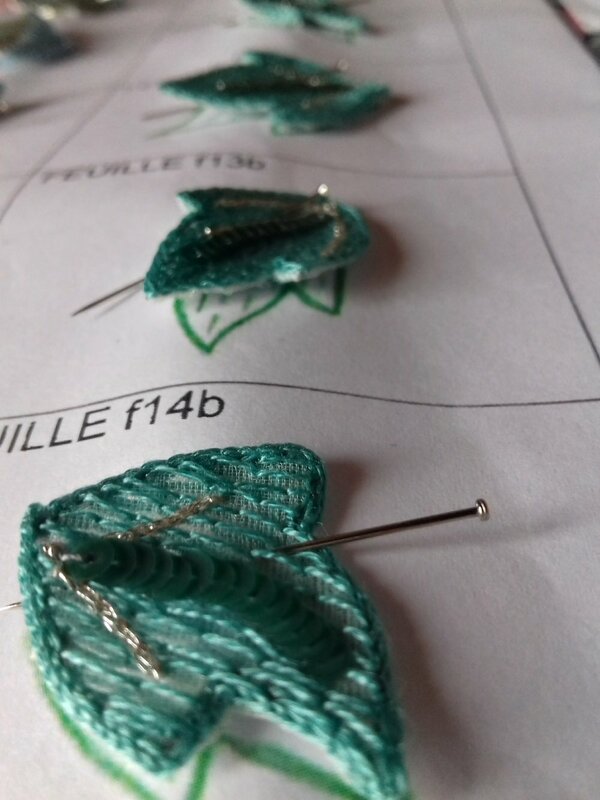 To create the undulating effect of the 3D leaves a single strand of embroidery floss was used to fasten the base of the leaf towards the stem. A pin is used to draw the leaf back on itself and form a curve in the centre or the sides and a flick at the tip. 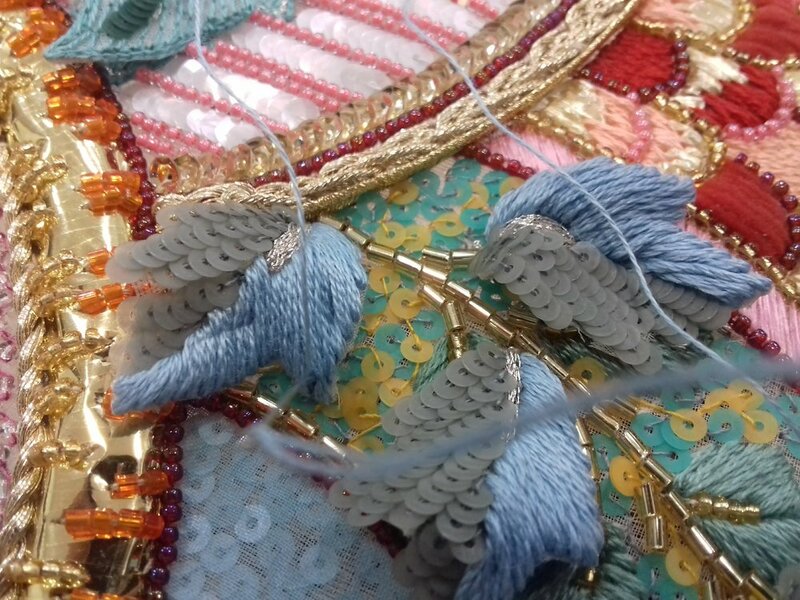 Two or three more anchoring stitches are added to hold the form and the pin is removed. Finally the sparkling blue turquoise jewels were added, fastened securely in place using the technique for applying clawed jewels.